Organizations are starting to consider the cloud to help relieve the stress of continued data growth. However, questions remain in the minds of many – what role can or should cloud storage play in the data center? What is the safest and most cost-effective path to get to the cloud? And is your organization ready? 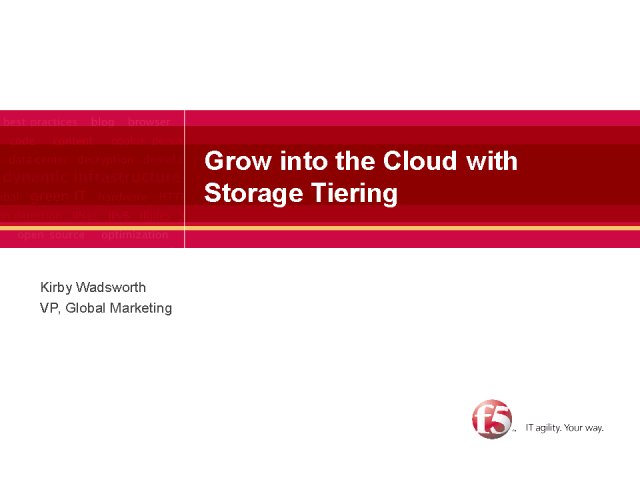 Join Kirby Wadsworth from F5 Networks to learn how data mobility and automated storage tiering can help you start the conversation. Whether your organization is embracing the cloud or planning to wait, these technologies give your infrastructure the flexibility to start reducing costs today, while making it ready to grow into the cloud tomorrow. Kirby is Vice President of Global Marketing at F5 Networks. Kirby joined F5 through its acquisition of Acopia Networks, where he served as Senior Vice President of Marketing and Business Development. Prior to Acopia, he was pivotal in creating the continuous data protection (CDP) market at Revivio, co-founded Storability, a pioneer in managed storage services, and served as Vice President and General Manager of Compaq's Network Storage Services Business Unit where he created the Enterprise Storage Network Architecture (ENSA) and led the introduction of multi-vendor storage networking.